As if I need another test of faith at this point of my life. Last Tuesday night, I needed to go out to WinCo to pick up my healthy breakfast stuff for the week: cereal, bananas, water, nonfat milk. I even made sure I went on a full stomach; a new Chinese buffet opened a quarter-mile from the store, on the way there, and I wanted to try their sushi rolls. OK; fine. No big deal. No temptations. Until I was finished and making my way from the dairy section to the checkout. One of the endcaps leapt out at me. No, not just any potato chips. Had they had they anything to do with Frito-Lay, the 8-million-pound gorilla of the junk-food world, I would’ve walked right past without a word. No — they were a brand from back East that I never would have imagined showing up in a California store. 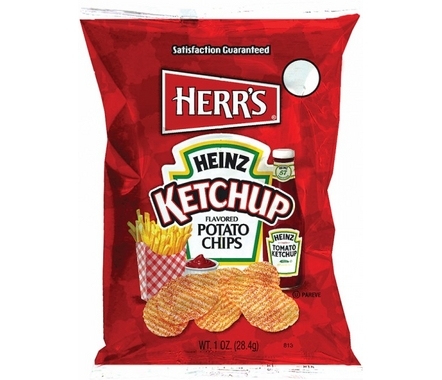 Herr’s Potato Chips, out of Pennsylvania, is a company known for its wide array of exotic-flavored chips, most prominently Heinz Ketchup. I’d bought them occasionally on infrequent trips to Pennsylvania, and once in a blue moon they’d show up in Connecticut, but not often enough to hook me. And here, on an endcap in a store in the thick of California, were siren red bags of Herr’s Heinz-flavored chips. Which I was able to resist at first glance with just a raised eyebrow. But then the fatal blow: Next to them were bags of Herr’s Horseradish & Cheddar chips. I love horseradish, be it in traditional or wasabi forms. And on chips, to boot? Herr’s chips? Wow. I felt my knees chopped out from beneath me. And I found myself backsliding. Or did I?